New Responsive Web Site Coming Soon! Discover the Secrets From A Real Genii! Welcome to the Wonder-Filled World of Geniiland where YOU are the Granter of Your Own Wishes for YOU are an all Powerful Genie! Inside these pages you will Discover the Secrets of a Real Genii and also meet Master Who-no. He is aTeacher of Magical Vision examples who taught me through fun Visioning Sessions that by believing in myself, I could become a Magical Deliverer of Granting Wishes. You must come to know your power is unlimited for you are the creator of this extension of the Source of all that is .Use that power with unconditional love and send that Love Wish out to be demonstrated. Script the end results you desire and watch the magic of the Universe show you Miracles can happen, even to you. WHAT do you really want or wish for? WHY do you want it? HOW will your life change when you have it? Are you still SURE that you want it? If the answer is YES, then you are ready to apply your new talent and ability to GRANT YOUR OWN WISHES! Love everything you wish for with the deepest feeling of this love that you can muster for it is the God Stuff of the Universe and there is no better way to receive. What you send out will be returned in Love that same way... Go forth now and “Live long and Prosper” as you Wish and watch your dreams unfold easily and effectively. Don’t EVER stop chasing your dreams, you never know where they might lead you as you learn how to Harness your Creative Power and Grant Your Own Wishes! Just rub the Magic Lamp of your mind! 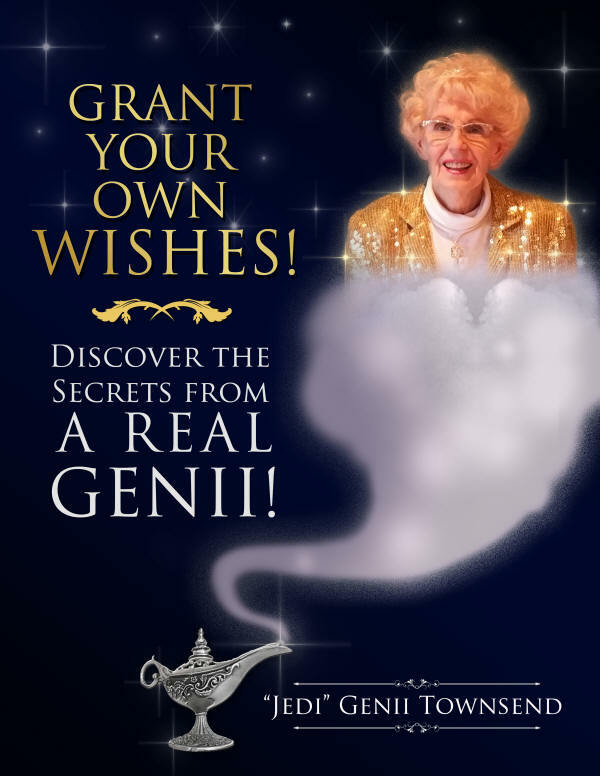 Genii has helped thousands of people world-wide enjoy having their wishes granted as she did for 18 years as the owner of Geniiland, a children’s marionette theater near Hollywood, CA. She has also helped many women become more empowered through the playshops and classes she has delivered for decades. In recent years, she has focused on facilitating The 4 Keys to Light and sharing information on Cities of Light she and her late husband, Rev. Dr. William Townsend received in her books, The City of Light Sedona and SOMETHING’S COMING! Universal Cities of Light, Love and Healing! ADVANCE COMBO ORDERS! The advance order includes the PDF edition of GRANT YOUR OWN WISHES! and an autographed copy of the first printing of the paper back edition for $44.44. Click Here to place your advance order and Thank You!